This space wallpaper is an artist’s view showing the planet orbiting the young star Beta Pictoris. This exoplanet is the first to have its rotation rate measured. This space wallpaper is an artist’s view showing the planet orbiting the young star Beta Pictoris. 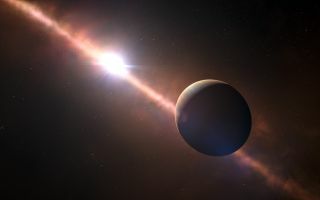 This exoplanet is the first to have its rotation rate measured. Its eight-hour day corresponds to an equatorial rotation speed of 100 000 kilometres/hour — much faster than any planet in the Solar System.